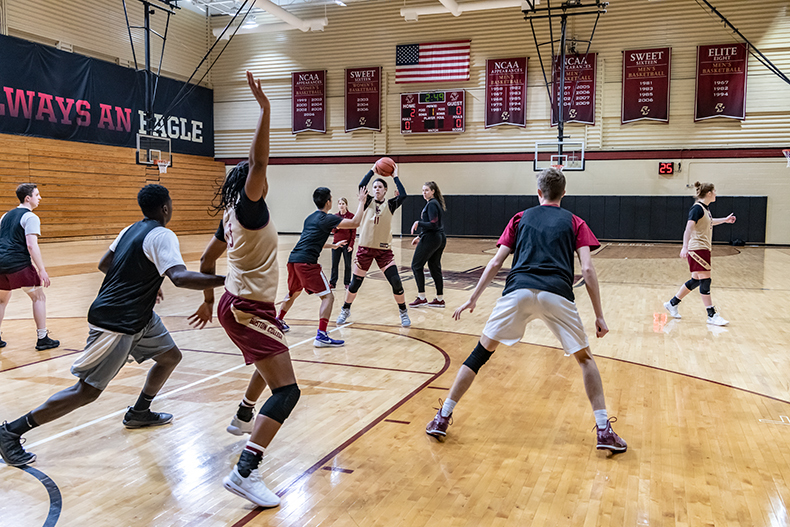 A half-dozen young men in workout gear—knee braces, high-tops, baggy shorts—climb the stairs out of Conte Forum’s Power Gym one November afternoon and make their way down narrow interior hallways until they reach the basketball court in Conte Forum. “I’m so nervous!” says Jack Beck ’21, a communication major. He’s half-joking, because they are here only to practice. And yet a game atmosphere is undeniable, with championship banners hanging from the rafters and the sharp blast of the shot-clock buzzer periodically splitting the air. The men, all undergraduates, are here to block shots and sink threes against the varsity women’s basketball team. They’ve watched film of the Eagles’ next opponent, Holy Cross, and each has been coached to emulate a particular Crusader. Now, the women’s head coach, Joanna Bernabei-McNamee, will conduct an intensive three hours of drills and scrimmaging. “Coach Mac” is in her first year at the Heights, having guided the University of Albany women to a record of 45–20 over two years. 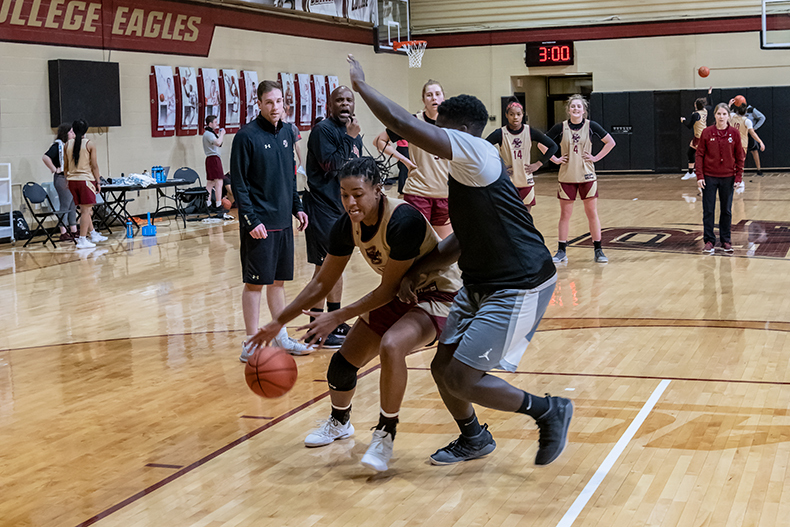 She and three assistant coaches (AJ Cohen, Yolanda Griffith, and George Porcha) shepherd the players, who have donned mesh jerseys, into their respective corners of the court; the men wear white, the women wear maroon and gold. “Here comes 25,” says Cohen, taking hold of Beck by his jersey and pulling him into place like a live chess piece to demonstrate a Holy Cross offensive play in slow motion. At Coach Mac’s whistle, the court erupts in shouts and sneaker squeaks as the men try to put over the play for real. And they succeed, passing the ball again and again to a shooting guard who sinks three-pointer after three-pointer, to the women’s groans. (When the guard bobbles the ball and boots it out of bounds, the women cheer.) 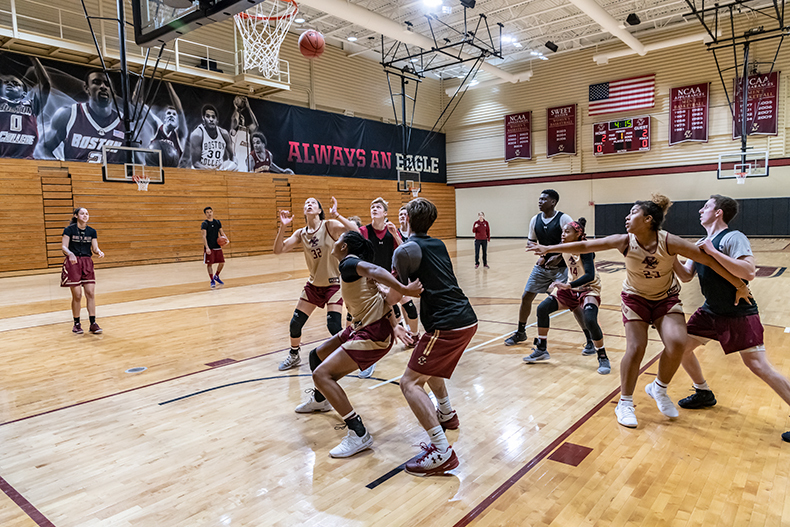 At intervals, Coach Mac whistles a stoppage and breaks down what went wrong in the women’s play, offering praise when warranted, while the men stand in place and wait. Then the drill begins again. 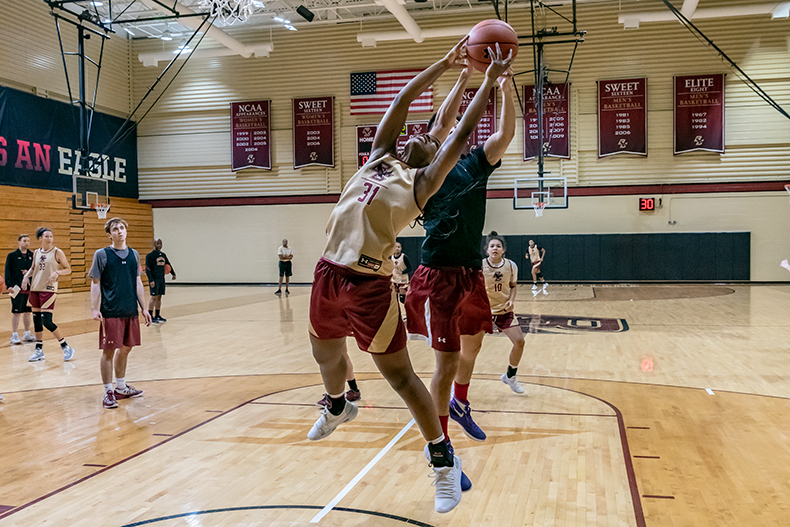 Mostly, the action takes place in the half-court, with the women executing plays for a score or working through their defensive plans. In a game known for trash talk, the exchanges at this practice are nearly all business. Cohen, who followed Coach Mac from Albany, has the assignment of coaching the men. “Good job,” he tells one of them during a pause. “You’re playing just like 22, brother.” Cohen was a practice player himself as an undergraduate, running the court with the women’s team at the University of Louisville. Other NCAA assistant coaches have gotten their start similarly. Indeed, male practice teams have been common across Division I women’s basketball for a couple of decades. 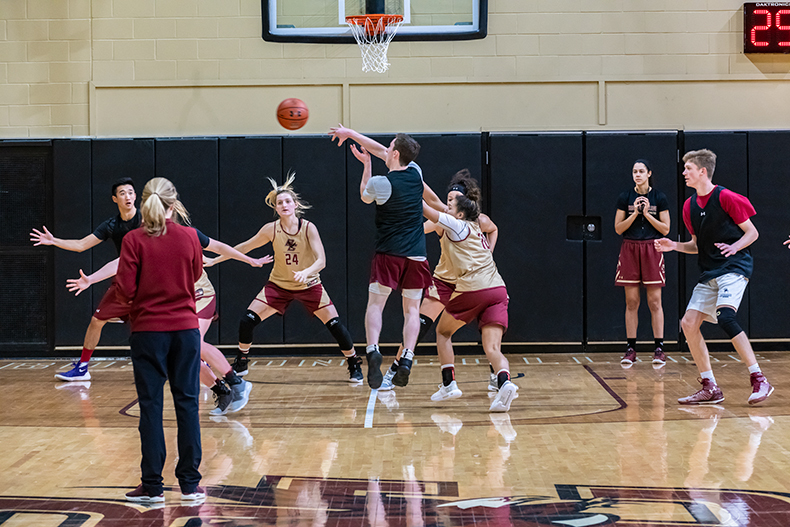 Quarterback Matt Hasselbeck ’97 practiced with the women hoopsters of Boston College before he went to the National Football League. The women improve their game by going up against the “speed and quickness” of the men, says Coach Mac. And the men “get to play high-level basketball,” says Cohen, and enjoy some measure of the discipline and the coaching that entails. “We’re always catching elbows,” adds Beck. 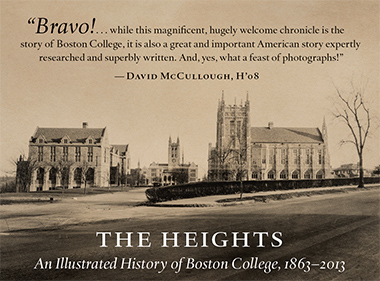 Patrick L. Kennedy ’99 is a writer in Boston.